We Believe -- Give Today! 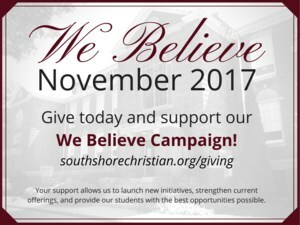 Give to our We Believe Campaign today and join other SSCA families in supporting our Annual Fund! 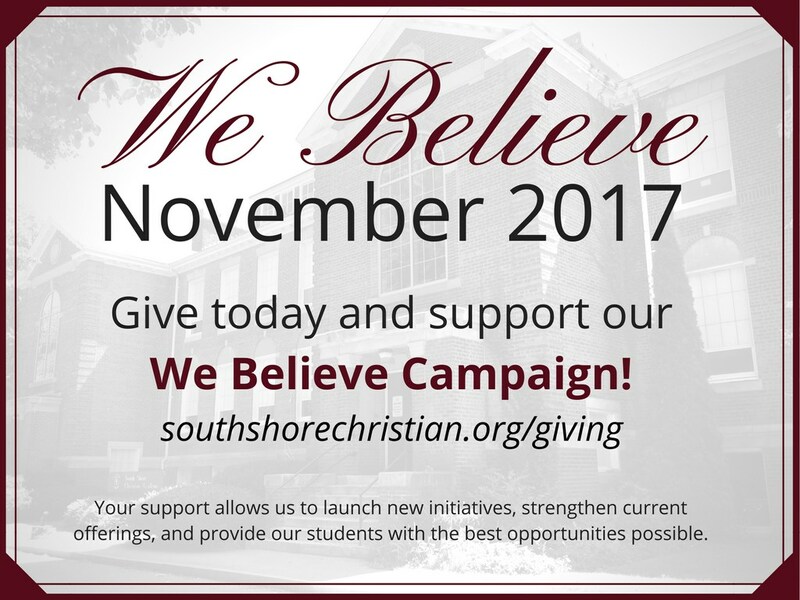 Here at South Shore Christian Academy, the month of November is devoted to supporting our Annual Fund through the We Believe Campaign. This month provides a wonderful opportunity for all our SSCA families to come together to support the work, mission, and vision of SSCA. Your support this month is critical to our success. Like most private schools, tuition alone does not cover the cost of an SSCA education, so every gift of every amount is vitally important in allowing us to provide the high-quality, Christian education that families have come to expect of SSCA. Last year we had 70% of our SSCA families participate in our We Believe Campaign, and we are aiming for 100% family participation this year! We have already had over 30% of our families participate, so join your fellow SSCA families in supporting our We Believe Campaign! Mail in your gift to South Shore Christian Academy with "We Believe" noted on the memo line, or you can give online at: southshorechristian.org/giving. We are grateful for your support as we seek to inspire our students to live generous lives of faith that bring goodness to the world.